As soon as he sees this recipe’s delicious, meaty chunks marinated in rich, succulent sauces, he'll go crazy for it. Pouch conveniently seals in the slow-cooked flavor and natural juices so the homemade taste your cat loves stays fresh and delicious. Specially formulated for kittens 2-12 months old. Also suitable for pregnant or lactating cats. -Enriched with calcium, phosphorus, and vitamin D for healthy bones and overall growth. -Contains natural antioxidants for healthy immune system. -Soft texture for easy consumption. Kittens grow 15 times faster than human babies, so having a variety of flavour is important to ensure that your kittens has a healthy appetite and receive sufficient nutrients to support such rapid growth. Being exposed to all kinds of flavour and texture at this stage also helps prevent them from being picky eaters in future. We advise that 2/3 of calories needed by kittens be given through wet food, and 1/3 of it be given through dry food. At the age of 1, your kitten needs different nutritional levels, and they are ready to transition to WHISKAS Adult 1+ years. 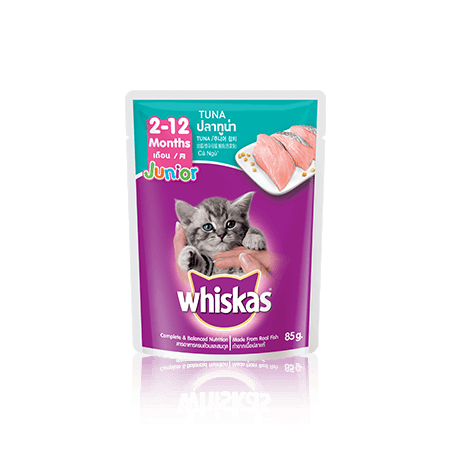 It’s easy, just add WHISKAS Adult 1+ in small portions to your cat’s food, slowly increasing the portion over time to replace WHISKAS Junior 2-12 months. The process should be complete within a week.